French composer; born at Strasburg Dec. 9, 1837. He commenced the study of music under the tuition of his father, a professional musician; later he became the pupil of Joseph Heyberger; and he completed his musical education at the Conservatoire in Paris. Here he pursued his studies on the piano in company with Massenet, a fellow pupil, who soon became his firm friend. About 1860, being obliged to discontinue his studies owing to lack of means, he turned his attention to dance-music. 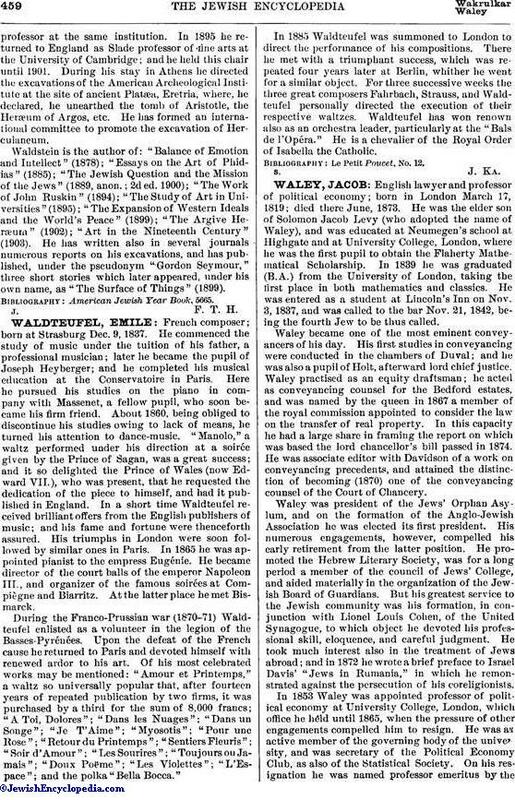 "Manolo," a waltz performed under his direction at a soirée given by the Prince of Sagan, was a great success; and it so delighted the Prince of Wales (now Edward VII. ), who was present, that he requested the dedication of the piece to himself, and had it published in England. In a short time Waldteufel received brilliant offers from the English publishers of music; and his fame and fortune were thenceforth assured. His triumphs in London were soon followed by similar ones in Paris. In 1865 he was appointed pianist to the empress Eugénie. He became director of the court balls of the emperor Napoleon III., and organizer of the famous soirées at Compiègne and Biarritz. At the latter place he met Bismarck. During the Franco-Prussian war (1870-71) Waldteufel enlisted as a volunteer in the legion of the Basses-Pyrénées. Upon the defeat of the French cause he returned to Paris and devoted himself with renewed ardor to his art. Of his most celebrated works may be mentioned: "Amour et Printemps," a waltz so universally popular that, after fourteen years of repeated publication by two firms, it was purchased by a third for the sum of 8,000 francs; "A Toi, Dolores"; "Dans les Nuages"; "Dans un Songe"; "Je T'Aime"; "Myosotis"; "Pour une Rose"; "Retour du Printemps"; "Sentiers Fleuris"; "Soir d'Amour"; "Les Sourires"; "Toujours ou Jamais"; "Doux Poëme"; "Les Violettes"; "L'Espace"; and the polka "Bella Bocca." In 1885 Waldteufel was summoned to London to direct the performance of his compositions. There he met with a triumphant success, which was repeated four years later at Berlin, whither he went for a similar object. For three successive weeks the three great composers Fahrbach, Strauss, and Waldteufel personally directed the execution of their respective waltzes. Waldteufel has won renown also as an orchestra leader, particularly at the "Bals de l'Opéra." He is a chevalier of the Royal Order of Isabella the Catholic. Le Petit Poucet, No. 12.